Diving deeper into the niche varieties of candy, one finds the fizzy category. One of my favorite-it doesn’t have many players. In fact, in my young 41 years, I only really have one outstanding fizzy candy (from the US, that it) in my personal favorites list: Zots!!! I won’t go into why they’re so ragingly awesome (read the review, numbnuts), but I have a few pounds at my house at all times. But aside from Zots…there’s just nothing that stands out. Screw Pop Rocks too, those don’t count. Across the pond however, there’s a whole other thing going on : Foamy candies. Or as they like to call them, “sherbets”. 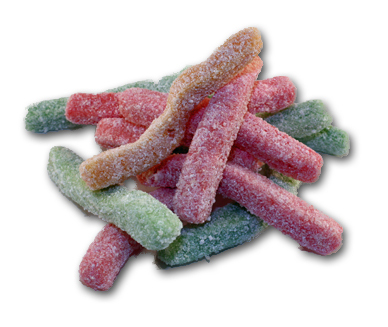 Think of it this way: a fizzy candy like Zots is a hard candy with a sour, fizzy powder middle that slowly starts to leak out. Delightful. The fizz is light, “bubbly”, and, ….well, “fizzy”. Foam candies have that same sort of intent-of some sort of fizz action. But think of the word “foam”-the feeling in your mouth isn’t of a sharp, acidic, light fizz, but rather of an overwhelming, “larger”, foamy, milky….foam. One is a 7-Up, and one is a Root Beer float. Make sense? My German friend Susie sent us yet another care package with some stuff in it I’ve never seen before. The thing that caught my eye first were “Stikkizz”. The consistency and flavors are very nice-chewy, tough, bright, sour flavors. But…the foam, man. The foam is just plain weird. Rather than being a welcome fizzy addition, it’s like someone shooting whip cream in your mouth in the back of a 7-11 at 2am when the dude at the register isn’t looking. Except you don’t get high from these, you just get a mouth load of sour, foamy body. I’m guessing the European community is much more used to these kinds of foamy “sherbets”-they’ve been around for quite a while. For me though, I think I have to stick to the fizz and leave the foams to the rest of the world. Just too busy for me. However, if you want to give them a try, you can get them here. This site is in German, but you can use Google Translate to navigate it, and word from our readers is that the shipping is very reasonable, but slow. So, faithful readers, I leave you to decide the fizz/foam debate on your own. If you try these, or other sherbets, please leave a comment and chime in with your take. Though that also brought back some good memories. Ah, high school. I, too, love Zotz. 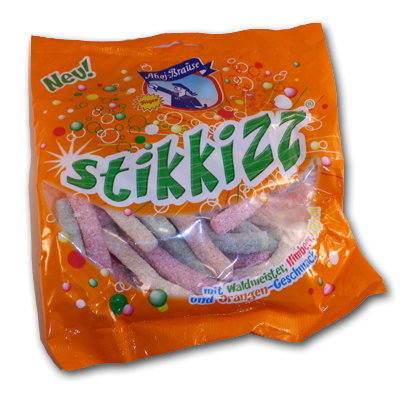 The only other fizzing candy I’ve actually liked were the Fizzing Whizbees I got once from a friend in the UK. Those look like I might give ’em a try, but your description of fizz vs. foam leaves me a little cautious. Maybe I’d try a small bite first. I’ve also been toying with the idea of eating a Fizzie tablet (effervescent drink tablet) instead of mixing it with water, but, hey, that’s just an idea–so far. I got the Salt N’ Pepa reference! of course i got the salt-n-pepa ref.